Lancashire Police are appealing for information about the identity of two men involved in a collision on the M61 on Saturday. Police were called at around 8pm on Saturday (January 26th) following reports of a serious collision on the M61 northbound between J9 and the M6 at Bamber Bridge. A Nissan Micra left the carriageway and collided with the central reservation before rebounding into the road where it was involved in a collision with a Fiat Ducato motorhome. A subsequent collision then occurred involving an Audi A6 and the rear of the Fiat. A Ford Fiesta then collided with the central barrier. The Nissan passenger, 12-year-old Ebony Gould from Lancaster, was taken to Royal Preston Hospital where she sadly died of her injuries. The driver of the Nissan, a 27-year-old woman from Lancaster, suffered minor injuries. Other parties were not injured. 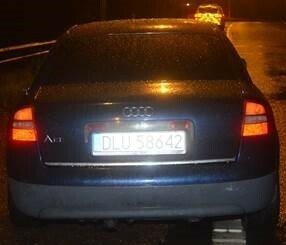 The two occupants of the Audi fled the scene and police are keen to trace and speak to them. They are described as Eastern European males, aged in their thirties, around 6ft tall. One of the males had a bald head and was wearing a navy bomber jacket. The other is described as wearing a black beanie hat and all black clothing, carrying a black holdall. The Audi (pictured) remained at the scene. It is a distinctive blue saloon bearing Polish registration plates with the number DLU 58642. Sergeant Marc Glass of Lancashire’s Road Policing Unit said: “Did you see this vehicle on the day of the collision or know who it belongs to? Likewise, if you saw anybody on Saturday evening matching the descriptions given, please let us know. We’re keen to speak to the occupants as they could be key witnesses to the first collision in which a young girl sadly died. “If you are the driver of the Audi or the passenger, please do the right thing and come forward. Please contact us on 101 quoting log number 1279 of 26th January or Crimestoppers anonymously on 0800 555 111.